If you are seeking answers to your questions about breast health and thermography, you’ve come to the right place. Below, we provide answers to our most frequently asked questions. If you have further questions not addressed in our FAQ, please contact us. Who performs the thermography screening? 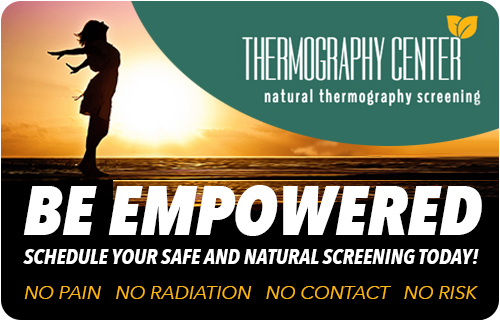 A female Clinical Thermographer that is both licensed and certified will administer all screening and testing. Who interprets the thermography test? Licensed and trained physicians who have years of experience interpreting thermal images interpret our thermography scans. What type of camera is used during the thermal screening? We utliize the state-of-the-art MediTherm 2000 thermal screening camera, a top-of-the-line imaging device used by many of the leading physicians worldwide. Are there any risks or side effects of a thermal screen? There are absolutely no risks or side effects of thermography. The procedure is safe, non-invasive, non-contact and no radiation. How long does a thermal screening take? Typically a breast thermal screening takes one half hour. A full body thermal scan can take up to an hour. Please plan accordingly. Is Thermography covered by insurance? Some insurance companies cover thermography screenings, but most do not. Payment is due at the time of service. We have found that some companies will reimburse or give a partial reimbursement and are happy to provide an invoice for you to submit to your insurance company. We accept cash, checks, credit cards and your Health Savings Plan. How should I prepare for thermal screening? Thermography is a temperature gradient study, so in order to get good, clear, accurate images, we need to conduct the appointment in a slightly cool room. Please choose the appropriate Client Preparation sheet (Breast, Full Body..ect) listed on our website under New Patients and Forms. You are asked and encouraged to fill out all the new intake forms before your appointment. Please inform our office if you are pregnant or nursing, have had a surgery or biopsy or are currently being treated with chemotherapy or radiation therapy. Thermography may not be an appropriate screening for you at this time. How is thermography different from other tests? Thermography is a test of the function and physiology of the body. Its role in breast cancer and breast disorders is to help in the early detection and monitoring of abnormal physiology and the establishment of risk factors for the development or existence of cancer. In addition, it is the only screening tool which can see indications of breast disease 8-10 years earlier than other methods. Do you offer any scholarships or financial aid? If you a woman or man in need of a breast screening, the United Breast Cancer Foundation (UBCF) will assist you with a free or low-cost breast screening regardless of age, income, gender, race, ethnicity or health insurance coverage.